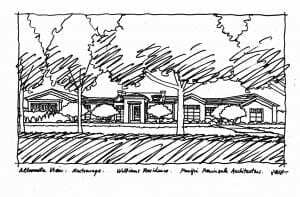 Above is the first rough sketch of this proposed residence designed by Pacific Peninsula Architecture of Menlo Park, CA. This sketch with trees and landscaping serves to illustrate the limits of the drawing and the major elements of the drawing, taken from the chosen viewpoint in perspective. Not a finished product at all–these sketches are tossed away–but are an important first step toward the eventual finished rendering.